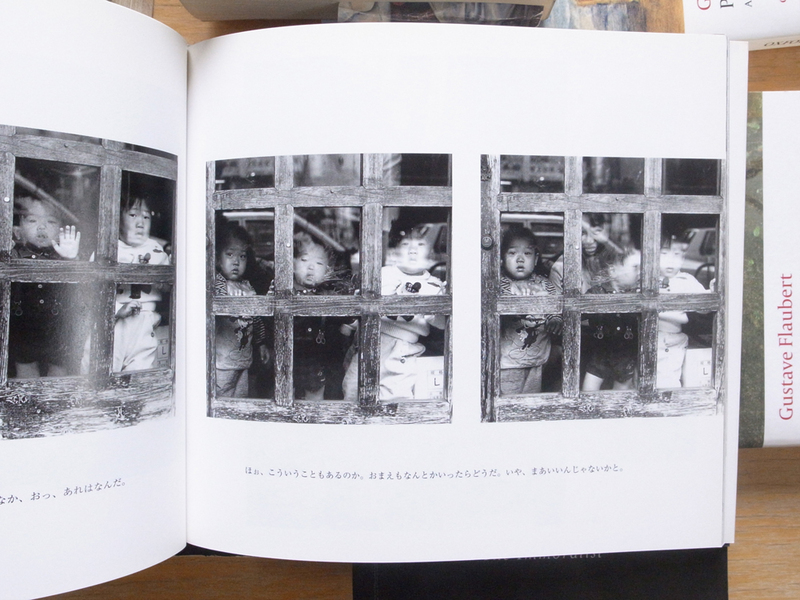 After a little break Jesse is back with a lovely little review of a little known Japanese photo book. Read on and find something new. One of the places I like in Japan is Book-Off. It is like a used book, magazine, and video game shop that has a good selection and prices. They then have a spin off with furniture and appliances called Hard-Off which I don’t think they get the context of such a name. The secret to Book-Off as my friend showed me is that they you can get lucky with their photo book selection (their English novel selection is horrible) and land some good deals. For instance, the last time I went I got Ume-Kayo’s first book for the 150 yen ($1.50). A lot of the time they do have crap, yet sometimes I buy something I know nothing about that becomes pleasant. 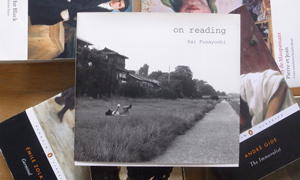 On Reading by Kai Fusayoshi is just that, a pleasant little photo book that I got for fewer than 500 yen. A glance at the title and the cover it is as it suggests about reading. I’m partial to it myself as I love reading, so it’s really nice to flip through the pages and see all the different types of people who enjoy something as simple and universal as reading words on paper. You see old men having a coffee over a book, a young couple stylish smoking in a café while reading and a school girl walking home engrossed in a book. All taken before 1997, the photos feel so much older in today’s context because of the lack of electronic devices that everyone is glued to these days. 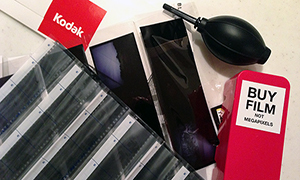 On that I could launch this review into a monologue on what technology has done, but I will stick with the photos. Stretching the definition of reading, his subjects are not only reading novels, newspapers, or manga, but they are reading situations. 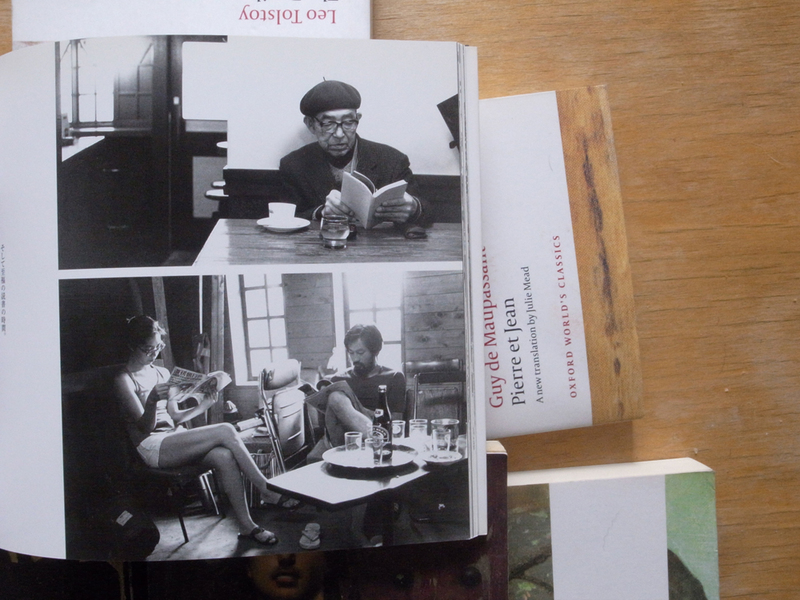 I guess the theme of having photos featuring people reading can quickly become redundant, which furthers the book’s pleasantness by stretching the definition of reading. 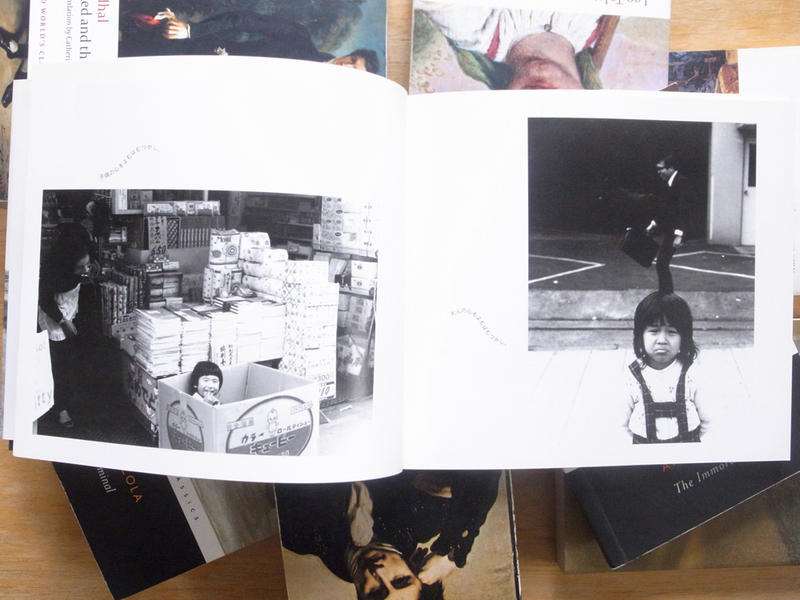 A two page photo set I liked features a little girl smiling in a box in front of a pile of books looking directly at the camera. This is juxtaposed with a photo of a girl in the immediate foreground also looking directly at the camera although she is sad. It is Fusayoshi himself reading the children’s faces in both situations. Other instances include a baby trying to read the face of playground elephant or two cats reading the faces of people passing by. 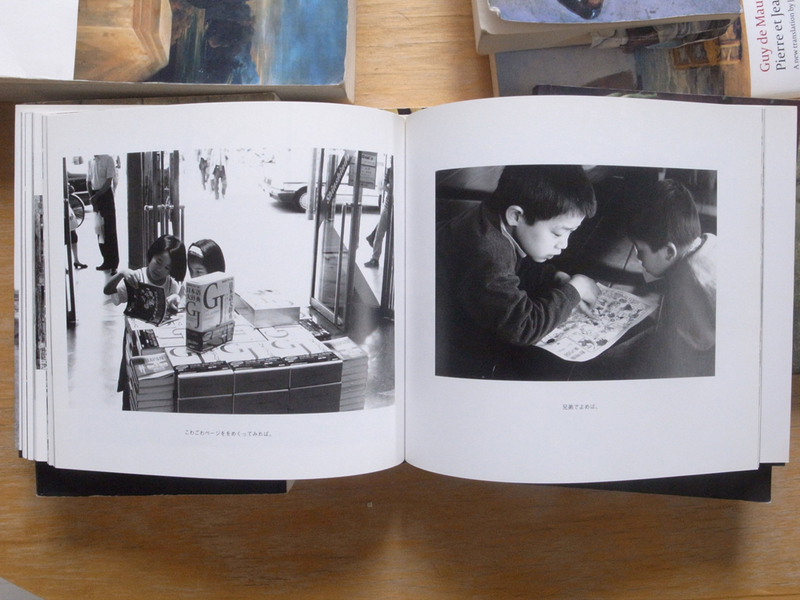 Children tend to be the subject of a lot of the photos which I think is indicative of the childlike experience of reading itself…but not only books but the world around them. There are a few instances of children with their face pressed to a window reading the outside world. These photos are almost literary in their meanings. The child is separated from the real world through a barrier that is a window. The window physically separates them, but allows them to glimpse on something they know very little about. This in essence is what a book offers children. 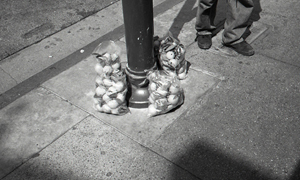 It then becomes noticeable how good of concept this is, for isn’t reading a great metaphor for photography? There is quote that no two persons read the same book. If you think about it; one can get the general context of a book similar, but they are never a like because of what the mind’s eye actually visualizes from the words on a page. Photography is very much the same. 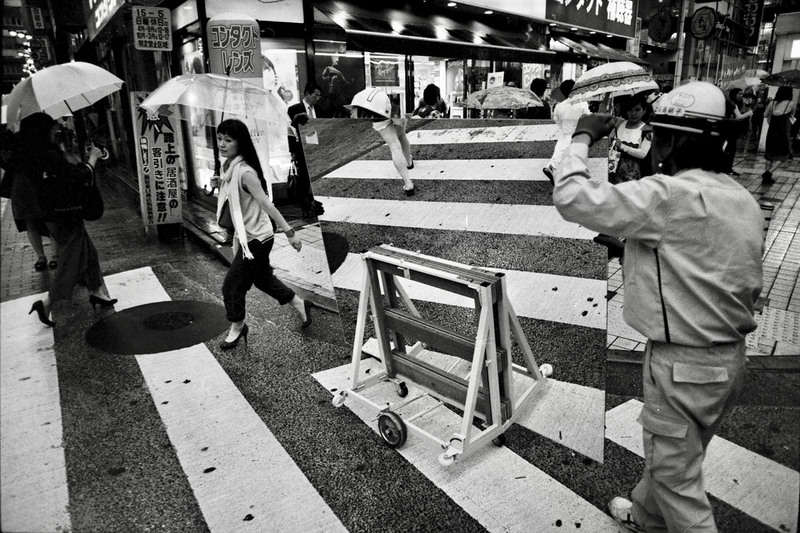 People can generally shoot the same subjects, but no two persons take the same photo. You literally read into this double metaphor with each turn of a page. Just to get some context for the book, I googled the photographer and found his page. He has published over 35 photo books and they all seem to be in a similar format retailing for about 12 USD. Unfortunately this one is sold out on Amazon, but I am sure some his books would be available. Or if you ever find yourself in Japan, check out a Book-Off located at most major stations. All in all a pleasant photo book for under 500 yen. 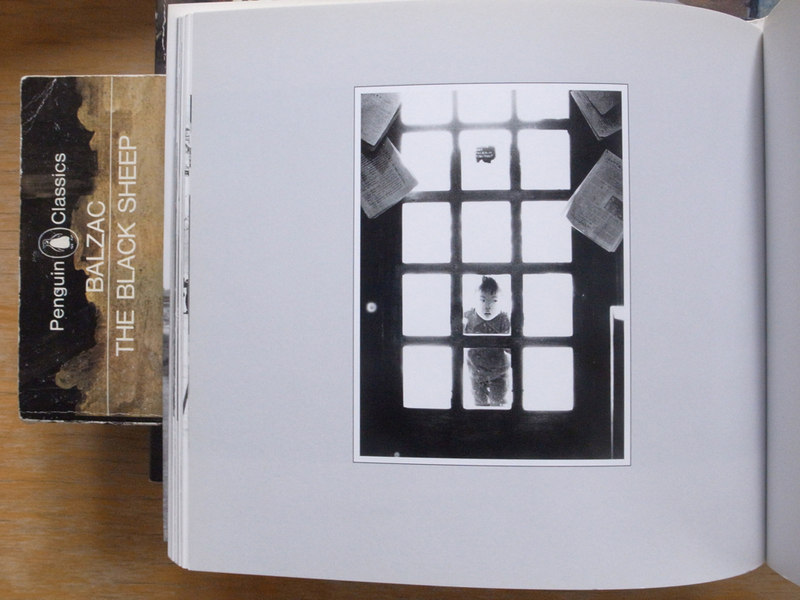 Andre Kertesz has a book of the same name which is an utterly fantastic collection of work. The photographs in the Kertesz, On Reading span the 1930s through the 70s. 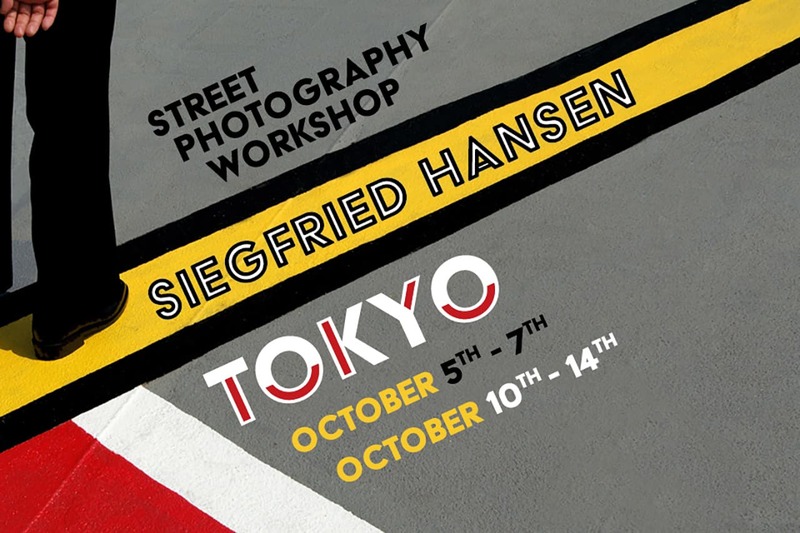 It might be interesting to compare the European and Japanese take on the same theme. I’m going to track down a copy of the Fasayoshi book to add to my bookshelf (once I find space for another book). Thanks for these reviews! Keep them coming! Wow…thanks for the info! That sounds really good, and certainly an interesting angle to take on it. I will see if I can’t find AK’s book! 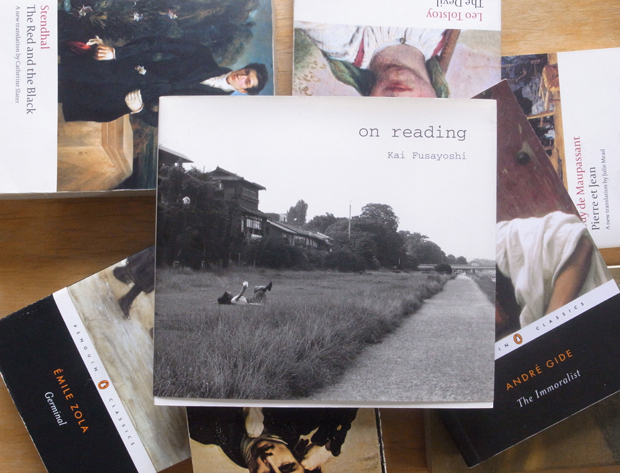 The book is probably a tribute to the “On Reading” book from Hungarian-born photographer André Kertész.